Okay, here is my shop of stuff, I'll say what I can and cannot do, this might be temporary, if I get on the graphics section I'll ignore this pretty much. -glowing pokemon okay, I cna make pokemon glow, but, I can't really do this wiht their game sprites, sort of, but it won'te come out as weel as my glowing mew, I can do one color, or a rainbow thing like on the mew. can i have a gary ( trainer) and a blazekin for an avatar? Gary with a blaziken? Sure! Here is the Psypoke colours! I go on paint and print-screened (button next to F12) and then pressed colour chooser and filled it in! I know, thats what I did, I tried it a few times but it keeps making the colors darker. Don't you just h8 it when that happens !? 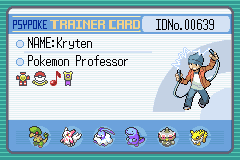 I'm replacing my Regice ava, so can you make me a Sydney with a Crawdaunt plz?? ok, sure, and I'll get to work on the av, steiner. Not sure if the blu'll show right but heres the one, it took me a while to find him, my internet was dying. Sorry for the triplepost, but, heres some samples of what I can do, sprite-wise, just remember, I can do more than sprites! Hey BSM, could I use the rockin guitar mewtwo for my Avatar? Yeah sure, remember, new rule, if you use one of my pics as an av give credit in your sig, no room? Do it in location. Ohh, tricky... never done it before but I'll give it a shot. I'm not sure if this is what you wanted, I did a golem in a gengar costume thingy, I can redo it if you want, I wasn't really sure what you were asking, also, it might not show up, if it doesn't just tell me and I'll fix it later. Is the umbreon trainer there for the contest at trsrockin.com, BSM? yup, I have one with the face for the contest, I colored it in for the display. Uh-oh! I have too many sprites on the sample so I guess in a bit I'll trim it down, oh, and I can now do pokes facing you, head-on. could you make a team aqua with a charizard? The leaf, still green, must someday fall. What, them fighting? That won't fit in an av, and if you mean together I can do that, just tell me which.